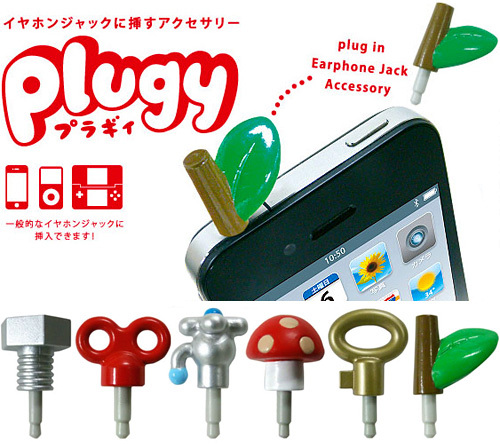 Plugys – Because Apparently Even Your Headphone Jack Needs Accessories | OhGizmo! I guess I’m partly to blame for writing about them in the first place, but when we first brought you the iCorkz a few months ago I secretly kind of hoped the idea of aftermarket port protectors would just fade away. But, I was wrong. Instead of quietly disappearing, they’ve apparently become a fad. And even worse, a novelty! While the iCorkz at least looked subtle and functional, these Plugys come in six ‘adorable’ different designs including bolts, a dripping faucet and even a wind-up toy key that are far too cutesy for my tastes. The plastic stem slides into your device’s headphone port so you can pretend that you’re protecting your expensive toy from dust and debris, but you’re not fooling anybody. They’re available from Strapya World for just $4.90 each, plus the cost of your MP3 player or smartphone’s dignity. perfect for keeping that pesky moisture indicator nice and dry! This company’s real product is selling repair services for broken headphone jacks, right?